Calling all artists who love drawing and meeting new like minded artists! Join us for a Draw By Night Toronto (www.facebook.com/DrawByNightTO) hosted event. This is going to be our first anniversary! A year ago we did our first Draw By Night event at the Handlebar in Kensington Market. This time we will be featuring an animation professional Stephanie Ramön, a storyboard artist working in TV and film industry. 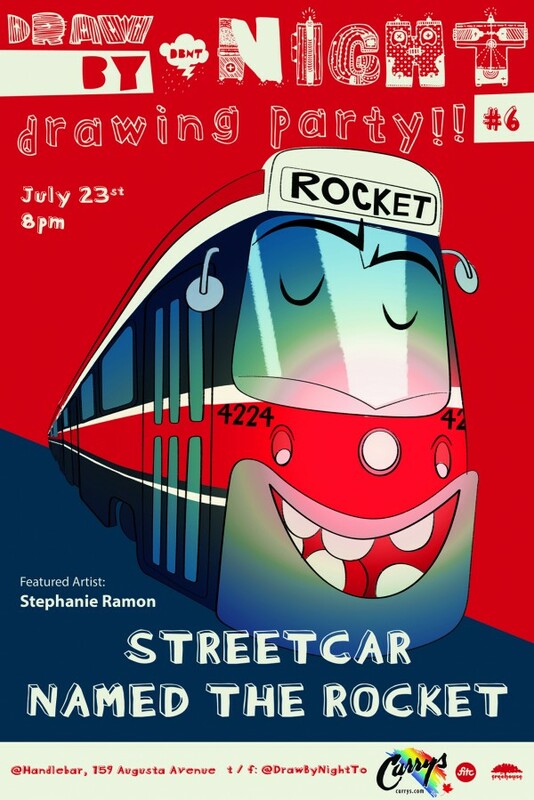 You are invited July 23rd to come out to draw, mingle and have drink with us! All art supplies will be provided by our sponsor – Curry’s Art Supplies and the event is free. At the end of the night we’ll collect all the drawings to be posted on our Facebook and instagram pages. Don’t forget to like our page to stay tuned for the updates. The doors opens at 7pm, we’ll start the artist demo by Stephanie at 8pm. Hope to see you there, Cheers! This entry was posted on Friday, July 18th, 2014 at 9:53 am	and is filed under News. You can follow any responses to this entry through the RSS 2.0 feed.